For our first Third Thursday of 2019, we decided to mix it up and keep it in-house. 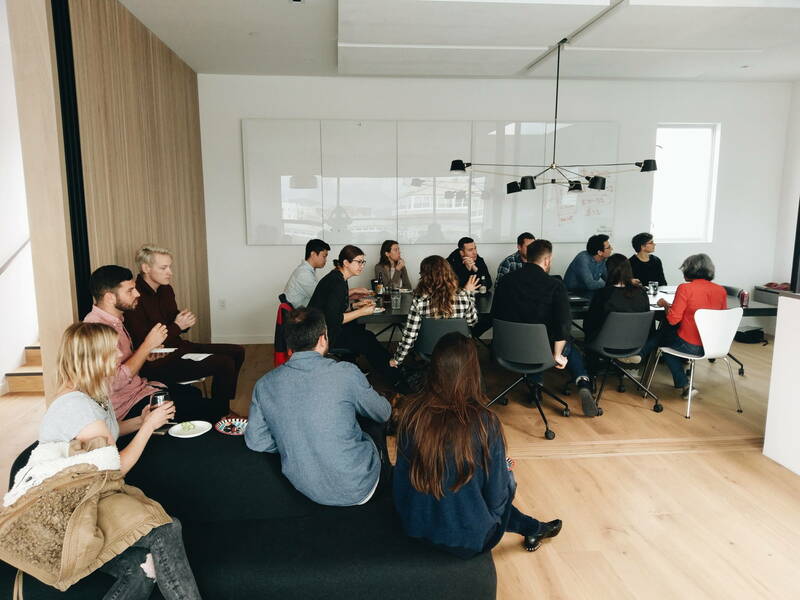 Our three newest staff members were invited to present on their backgrounds and previous work from schooling or companies they’d been a part of before joining our firm. Each came from different locations with unique focuses, skills, and talents. Jeremy presented on a few of his residential endeavors, as well as his own fine arts projects. Kateryna had us explore some of her graduate work and gave us an insider perspective on what it takes to build skyscrapers around the world. Laura spoke about various buildings she worked on while living in Boston, and how they compare to the projects here at our firm. Each wrote a quick summary of their presentations which you can read below! While at a previous architecture firm, I completed a house just outside of Montecito. The 9,000 square foot house has a commanding presence on Padaro Beach, highlighted by 40’ wide pocket doors beneath a 14’ cantilever. The exterior materials are reclaimed teak from Thailand, board formed concrete wainscot, standing seam titanium roof, and steel windows and doors. The interior finishes include rift sawn white oak ceilings, plaster walls and custom concrete pavers on the floor. The house features dual master suites on the second floor with panoramic views (one for the clients and one for their son who lives in LA). The owners recently moved in and I flew down to welcome them, happy to complete such an awesome project with stellar clients. For my Third Thursday presentation I described my experience designing large-scale residential developments in Boston. One of the projects I highlighted was 345 Harrison; a 12-story, 585 unit project in South Boston which included ground floor retail and restaurant spaces, elevated private parks for tenants, an indoor gym, an exterior pool and lounge, and many more tenant amenities. Working on 345 Harrison gave me a great sense of accomplishment as a designer – it was an honor to contribute to such a landmark development in my home city. Residential projects here at Feldman are, of course, much smaller in scale, but offer a much more personal design experience and a more focused vision, on a faster schedule – It’s a great change in pace! I can’t say how thankful I am to be a part of the team here at FA. Several weeks ago I had pleasure to share a brief overview of my design work from the Master Degree that I received at IAAC, in Barcelona, as well as a variety of projects from my previous work experience at SOM and Morphosis. Academic projects covered my interest in temporary architecture, wind energy harvesting and clay tile making inspired by a visit to a renowned Catalan ceramics factory. This work resulted from the numerous discourses that were held at the school, and looked at ways to challenge energy wasteful living, while growing social awareness on the issue. 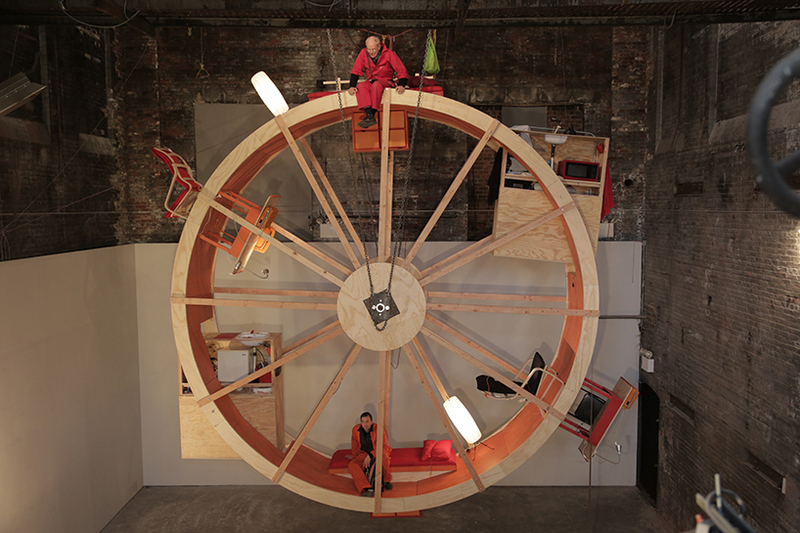 The Nubular lightweight structure, is an exploration into an injection-based architecture. A homogenous building material, in this case perforated pvc skin, is used to create tubes of custom lengths and angles, which are then filled with one’s material of choice depending on the chosen tube’s position within the overall structure. Given that the material filling is a key parameter in the behavior of the structure, several tests were carried out to identify the optimal fillings and member lengths to avoid buckling. It was decided to fill the bottom most members with soil and sawdust mixture, while the top is composed of lighter foam balls. Each tube length is split into 3 with a maximum part length of around 800mm, and allowing for 50mm flat connection gaps in between and at the ends of each tube. The overall shape was designed in grasshopper using hoopsnake plugin. An original tetrahedron shape is drawn, and hence follows the path of an arched curve, turning and repositioning itself in the process from the start of the path to the end. After this process, the geometry was manually pulled to the ground plane and specific 3-piece curves were extracted and drawn to ensure they stay under the 800mm limit. Each of the curves was separated as a layer and with lengths fed into another definition to directly produce laser cut files which included labels and welding line engravings. The fabrication process took about 3 full days. 78 custom lengths were laser cut, welded, filled, and holed at the junctions for connections with zip-ties. Construction took around 10 hours. What better place to spend our October Third Thursday than San Francisco’s own ‘House of Legends’? The iconic Westerfeld House in Alamo Square is shrouded in lore and legends. Once home to Russian diplomats, various communes, and the founder of the Satanic Church himself, the home has seen its fair share of uncommon dealings. We were lucky enough to score a private tour with the home’s current owner, Jim Siegel, who purchased the house back in 1986. We arrived on a windy Thursday evening, wine and cheese in hand, with varying expectations as to what was in store. Upon entering the home we were all blown away by the gorgeous work Mr. Siegel has done to restore the house to its original beauty, classic Victorian wallpaper and all. After depositing our offerings in the dining room, Jim began our tour with an informed recap of the unique history of his home. Commissioned back in 1889 by a German confectioner by the name of William Westerfeld, the house has changed hands numerous times throughout its history. Jon Mahoney, a famous San Francisco contractor, bought the house after Westerfeld’s death in 1895. He and his brother Jeremiah are most well-known for their restoration efforts after the great fire, as well as for building the Palace Hotel, St. Francis Hotel, and Berkeley’s Greek Theater. The Mahoney Brother were also large fans of entertaining, inviting honored guests such as Guglielmo Marconi and Harry Houdini to attend and perform at their dinner parties. In the 1930’s, the house ended up in the possession of a group of Czarist Russian immigrants, who opened a night club in the ballroom called “Dark Eyes.” It was during this time that the house earned the nickname ‘The Russian Embassy’, which is still prevalent today. Jim told us that a Russian colonel was allegedly murdered in one of the house’s many rooms, supposedly during a fight over a woman. In the 1940’s and 50’s, the space was converted into a boardinghouse that attracted many jazz musicians from around the city. John Handy, Art Lewis and Jimmy Lovelace were all said to have been boarders at the house during this time, though John Handy later claimed this was false. Leading up to the 1960’s and 70’s, a series of communes came to call the house home. Jim mentioned that in his younger years he had a large fascination with the Woodstock era and has since dedicated one room in the house to the communes that once lived and played between its walls. During the commune years, underground filmmaker Kenneth Anger came to live at the house and filmed a number of his cult classics. Featured in the films was Bobby Beausoleil, a Manson family sympathizer who is currently serving a life sentence for first-degree murder, as well as Anton LaVey, founder of the Church of Satan. During our walkthrough, Jim eagerly pointed out a photo he had of LaVey and his pet lion sitting calmly in the upstairs library. The final commune to occupy the house was a 50 member collective called Family Dog, who held concerts and shows at the Avalon Ballroom and invited musicians such as the Grateful Dead to hang out with their members. Jim recounted during his explanation that he always knew he would one day purchase the house. When he was boy he likened the exterior to that of the Adam’s Family House and since then has harbored a dream to own it. When he was only 19 he began buying and restoring old Victorian homes throughout the city. His first house he bought for $10,000 in Dogpatch and has since then purchased, restored, and scavenged tons of homes throughout San Francisco and beyond. He told us about a barn he has up north full of Victorian molding, doorframes, doorknobs, furniture, and more. He bought the Westerfeld house for $750,000, an enormous sum of money back in the 1980s, much to the chagrin of his father. Since then he’s spent thousands of hours fixing up the 25 rooms. As we wandered the house all of us were in awe of the care put into each and every room, as each had its own character. Personally I was struck with the thought of the potential for hauntings, but Jim informed us that one of the first things he did upon purchasing the property was have it blessed by Buddhist monks, putting that thought to rest. One of the most impressive rooms by far was the upper tower, where one can experience views of the San Francisco skyline. Jim mentioned that he’s watched the skyline change over the years, and misses the days when he could see clear across the bay. The house is full of stories, even in places we can’t see. Evidently there’s a satanic pentagram carved into the floor of the tower, and you can find teeth marks from LaVey’s pet lion on the occasional doorframe. In the kitchen there are paintings by Janet Joplin’s lead guitarist, and quirky furniture, such as a coffin coffee table, in every room. The last few hours of our visit were spent talking over wine and charcuterie about Jim’s outstanding work, and our similarities and differences as “modern architects.” Despite our firm having more modernist sensibilities, all of us can appreciate and love the traditional beauty of San Francisco Victorian mansions like Jim’s. Although not open to public tours, there are various ways in which one might be able to take a peek inside the Westerfeld House. Jim occasionally opens his home up to various events, such as the Gallery Girls Haunted Mansion on October 27th. A few of us took advantage of the opportunity to see it once again and attended this past weekend. If you’re interested in learning more about the history of the Westerfeld House, I encourage you to visit The House of Legends, a website dedicated to a documentary coming out in November about the house’s eclectic history. We’d like to extend an enormous thank you to Jim for taking off from work early to show us his masterpiece. Hopefully we can all visit again soon! ­­­As architects and designers, part of our job is helping our clients pick quality materials for their homes. When it comes to furniture, it pays to put our hands on the products so we can feel the quality of the materials firsthand. When we suggest a chair for a home, the hope is that that chair will not only blend seamlessly into our design but will also stand up to the tests of time – or the tests of your labradoodle thinking they deserve a place at the table. A few months back before I made my way to Feldman, I came across one of these chairs. Just a stone’s throw away in the heart of the mission is a company that exuberates these qualities. I found Fyrn while searching through job listings. In researching the company, I was immediately drawn to their website and its immaculate portrayal of the line of furniture they are producing. 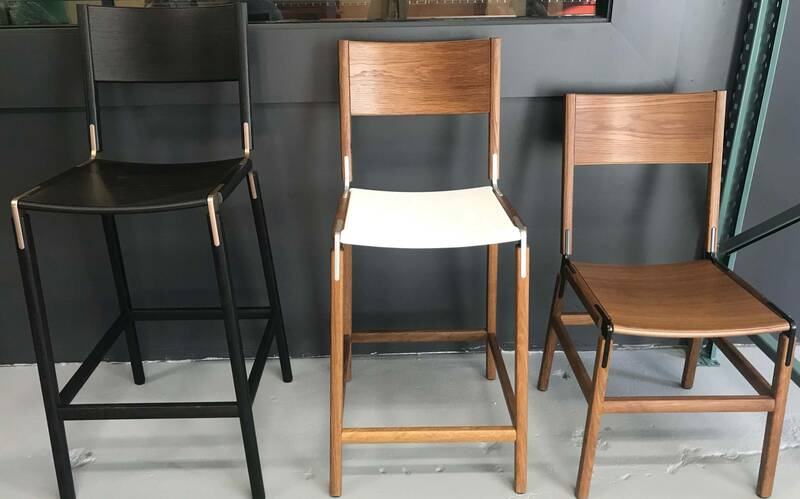 There “Stemn” line is a modern rendition of the classic American Hitchcock chair, retaining the simplicity of the original chair but completely rethought to meet the demands of today’s production needs. Though totally unqualified for their “CNC Programmer/Machinist” listing, I reached out to Fyrn in hope of learning more. To my surprise, the two head honchos responded in kind and we set up a time to meet. I met Ros and Dave at Sightglass, which seemed to be a precautionary vetting location to make sure I wasn’t a patent spy with ill intentions. Whatever I said instilled enough trust in them to walk me over to the workshop – or toy store, depending who you ask. All I can say is that my tour of the space forever changed the way I think about furniture production and how I can strive for the same values that Fyrn instills in their furniture in my own work. Fast forward a few months and I find my way to Feldman. When I heard about our Third Thursday program I jumped at the opportunity to share what I had been shown in the Fyrn laboratory. For our most recent Third Thursday, the Feldman team headed over to the mission with cheese and beer in hand to meet the makers at Fyrn. Upon arrival we were greeted by their team in a newly remodeled space lined with examples of each and every piece of their furniture line. Our designers quickly took to testing as we gathered around, sitting on each version of the Stemn line. As everyone got settled, partners Ros and Dave began to tell us about the line and how it came to be. At the heart of their work is a desire to bring people together through a system that changes the relationship between people and the objects they choose for their homes. 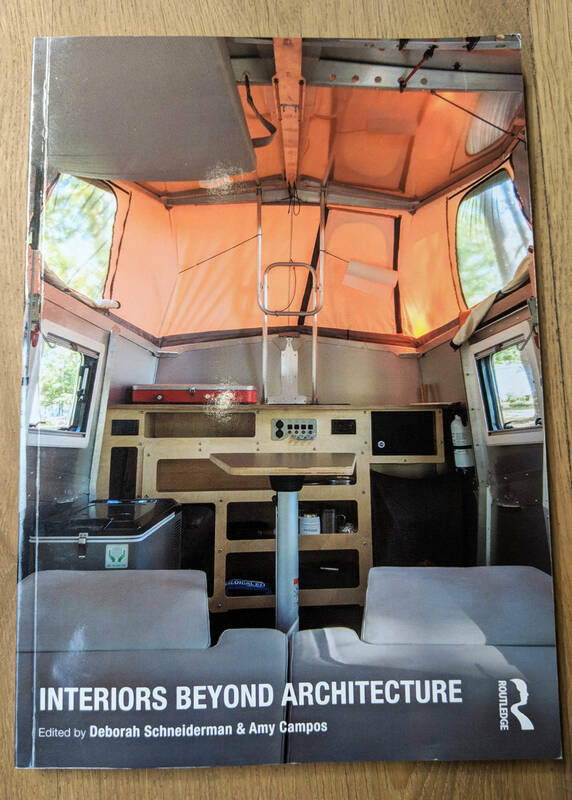 The thing about Fyrn’s furniture is not that it is flat packable, but that the entire system is modulus and uses minimal connections across the line. This makes the it easy to put together but also easy to replace an individual part if something were to ever break – which is unlikely due to the shear quality in the materials they use. The Stemn line was designed with this intention and hopes of, “moving people away from a disposable culture by creating a sense of connection between people, place and materials”. This is a mentality that most architects can agree with. We continued our tour through to the workshop where the real operations take place. As we walked around the space, Ros and Dave walked us through the everyday processes of creating their product. Their organization quickly became apparent as they explained their operations from one step to the next. In San Francisco, space is sparce. To deal with this, Fyrn’s shop is in a constant state of flux as heavy machinery, equipment, and material move through the space to accommodate each process of the production. The lack of space partly influences the design of the products themselves. Flat packable furniture comes with the perks of being flat storable as well. So each small piece of the Stemn system has its place in a custom storage solution further displaying the ingenuity of the designers at Fyrn. What sets Fyrn apart in my eyes is their attention and patience in designing a piece of furniture that meets today’s needs for fast paced production while maintaining the quality of a handmade chair built to last through generations. These heirlooms allow people to connect with one another through the familiarity of an uncommon object – not dissimilar to the intentions of an architect and their building. Thank you Fyrn for allowing us to see your process. We hope you enjoyed it as much as we did. Asking myself where to properly store a custom fire pick in my apartment was never really a question I’d anticipated asking. However it’s exactly the mental discussion I found myself in after spending an enjoyable and informative evening at Jefferson Mack Metals. 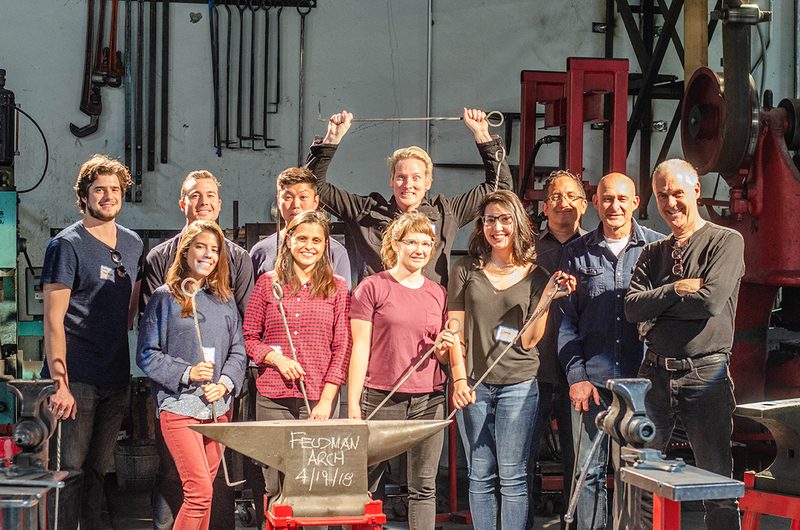 For our most recent Third Thursday, the office was invited to participate in a blacksmithing demonstration with Jefferson in his San Francisco workshop. As a full-time blacksmith, he is dedicated to creating beautiful, unique, honest pieces, rooted in the traditional aspects of metal working. Our experience was equal parts learn by demonstration and learn by doing, as we were able to take part in creating our own metal art with the help of the talented workshop designers. The evening began with a meet and greet over charcuterie, followed by a quick gallery tour. Jefferson Mack is known for innovative metal design, the more “out-there” the better. The small room was filled with delicate sculptures, wall pieces, and serpentine furniture. Our designers were particularly drawn to an upright pendulum, situated at the front of the garage workspace. As we admired the array of pieces, Jefferson explained the history of his practice and the different collaborations that had occurred over the years. In conjunction with Aaron Gordon Construction Inc., he hosts monthly workshops similar to the one we attended in order to allow suppliers and clients alike to get a taste of the process behind their requested pieces. He’s also worked with various artists and other creatives to forge everything from gazebos to cutlery! Before beginning the hands-on portion of the evening, Jefferson sat us down for introductions and an explanation of the process. Then, in groups of three we began forging our fire picks. To begin, the steel metal rod was heated in one of their few furnaces to a temperature of about 2246 degrees Fahrenheit. Together with a resident blacksmith, we each hammered the tip to a point, bent it over an anvil at a 90 degree angle, shaped the handle, and added decorative twists. Since our group was only 10 large, each interaction felt extremely individualized. I was able to spend as much time as I desired hammering, twisting, and perfecting my piece. The atmosphere was lively and comfortable, and not as hot as I’d expected! The entire process took a little over an hour, leaving plenty of time for chatting and refreshments at the conclusion of the evening. Before departing, we were able to watch Jefferson in action, forging delicate spirals out of the hot metal with seemingly little effort at all. He also passed around a few small pieces from his gallery, and opened the floor to questions. 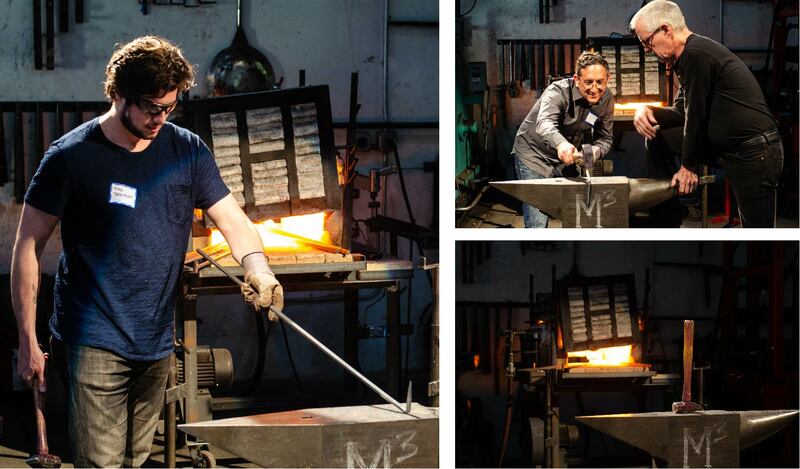 The conversation focused around the history and background of blacksmithing, at what age each artist started, how long an apprenticeship generally lasts, and what metals they typically work with at the shop. At around 8pm it was time to leave and we were all struck with a similar thought: Would BART or an Uber be a more appropriate mode of transportation home while carrying a newly forged fire pick? We were split on the answer. 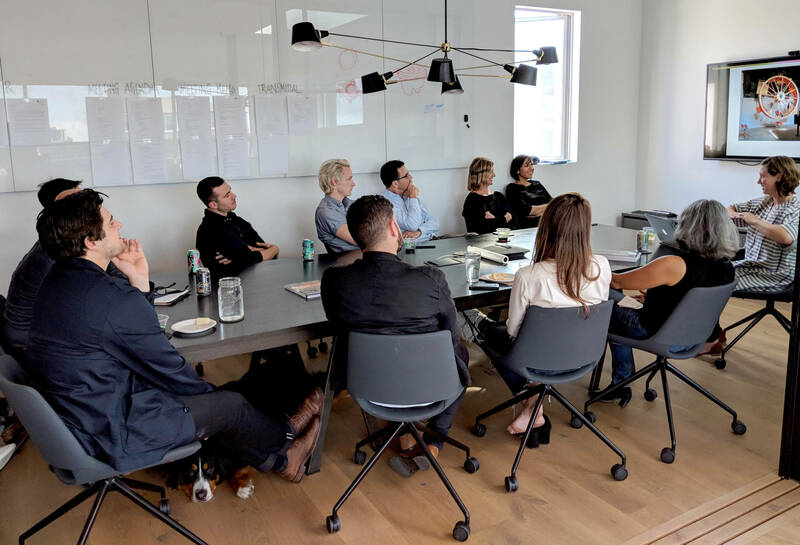 Our experience at Jefferson Mack was warm and inviting in more ways than one and a truly beneficial experience to designers and office assistants alike! Now all that’s left is finding a fireplace or planning a company camping trip to use our new tools! We invite you to learn more about their fantastic studio and the craft that they’ve mastered on their website! Thank you so much for having us Jefferson and we look forward to collaborating with you in the future! As an architectural firm, we’re always looking for new ways to expand our creativity and invite new inspiration. At our latest Third Thursday, Hope Mohr, of Hope Mohr Dance, stopped by to share her own unique creative process and offer some advice on what values we as artists could share. A world famous choreographer, curator, writer, and Columbia Human Rights fellow, Hope has striven to deconstruct the intersection of dance and poetry, while continuously supporting her fellow artists. She pulls inspiration from other creatives around her—painters, writers, even historical buildings and their illustrious beginnings. Hope began the session by introducing us to case studies based on two of her previous works, Stay (2015) and Precarious (2017). She familiarized us with her inspirations for both and the way she harnesses her dancer’s agency during the creative process. Creating art for art’s sake is a strong motivator for her pieces, as she isn’t afraid to bring the audience into the realm of the uncomfortable. In order to make her dances evoke the same feelings as that of a painting or work of literature, she spends months researching and preparing potential artistic influences. Her 2015 piece in particular, drew inspiration from the works of Francis Bacon and his use of saturated colors, distorted figures, and arrow motifs. One of her goals for the performance was to force both herself and her audience to stay longer in moments of discomfort, and to incorporate uncommon silhouettes and images. She noted, to our interest, that she often choreographs her pieces without music, and has a sound engineer create the soundtrack at a later date. In this way the movements are a direct response to the physical subject matter, rather than the instruments of a song. Towards the end of the hour, Hope touched upon one of her upcoming pieces extreme lyric I and asked our staff for an architect’s point of view on using polarized light. The discussion that followed evolved into a conversation about the ‘client’ of her work, be it the audience, dancers, or even herself. When designing a building, the client is more often than not involved directly in the creative process. In her dances however, Hope was wary to identify a specific client, for her works are not entirely for the dancers nor the audiences who view them. The question of clientele holds true for any artist, who exactly is one creating for? Her advice rang true with many of our designers, who, despite a lack of dance background, could relate to and understand the unique struggles of a creative. We all hope to see Hope’s new performance extreme lyric I in October of this year and if we’re lucky enough, have her come back and speak again. Thank you for the inspiring talk Hope!